Anthony Grahame has been a writer for more than 15 years. He began writing professionally online in 2008. He has a degree in English literature from the University of Sussex and is an experienced traveler and travel writer. His work has been published on a variety of well respected websites including "Living in Peru". Thanks to the game’s long history, soccer has grown to become the most popular sport in the world. Millions of people around the globe watch major competitions, and soccer stars become huge international celebrities. 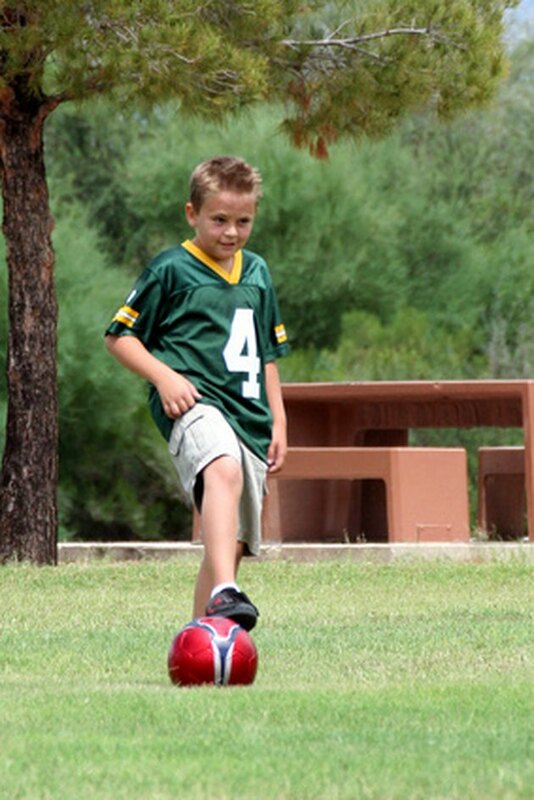 Many kids worldwide play soccer, because it is relatively simple to play on a beginner level--and it is fun. Nobody knows for sure who invented soccer, or when. According to the Fédération Internationale de Football Association, international soccer's governing body, there is evidence that people in China might have played a game similar to soccer more than 2,000 years ago. However, modern soccer traces its origins back to medieval England. Village ball game contests slowly evolved into a more organized sport by the 19th century. The newly formed English Football Association wrote the first official soccer rules 1863. This association still governs English soccer today. The rules have changed over the years, but the basic game is still the same. The Fédération Internationale de Football Association, commonly known as FIFA, is the governing body of association soccer. FIFA organizes and regulates all of the main soccer competitions in the world. It also has control over any rule changes. Soccer is known as football throughout most of the world. In North America, however, the word soccer is used to avoid confusion with American football as played in the National Football League, or NFL. Soccer is the most popular sport in the world. According to figures published on The Independent website, at least 260 million people watched the 2006 World Cup soccer final live on television. In comparison, approximately 98 million people watched the 2006 Super Bowl. The World Cup is the biggest and most important soccer competition. It is an international competition, with each team representing its own nation. Each country in the world also has its own national competitions between clubs. Soccer first appeared in the Olympic Games in 1908. Many consider a Brazilian named Pele to have been the greatest soccer player of all time. However, others argue that Diego Maradona, an attacking midfielder from Argentina, was as good as Pele. Each year, FIFA names one player the World Player of the Year. This is arguably the greatest recognition that an individual soccer player can receive during his playing career. Soccer players can make a lot of money. Soccer stars earn a lot from their clubs, and they make even more from sponsorship and advertising deals. According to The Daily Mail Online website, Lionel Messi, the 2009 FIFA Player of the Year, earned more than $41 million in 2009 alone. The Independent: "Why Fifa's Claim of One Billion TV viewers was a Quarter Right"
Daily Mail Online: David Beckham Toppled by Lionel Messi as Barcelona Star Leads Football Earner Charts on £570,000 a week! What Is the Difference Between Latin American & European Soccer? How Many Calories Are Burned Playing Video Games?